Ooh, I love a road trip and when it’s combined with a library talk and room filled with enthusiastic readers, even better! 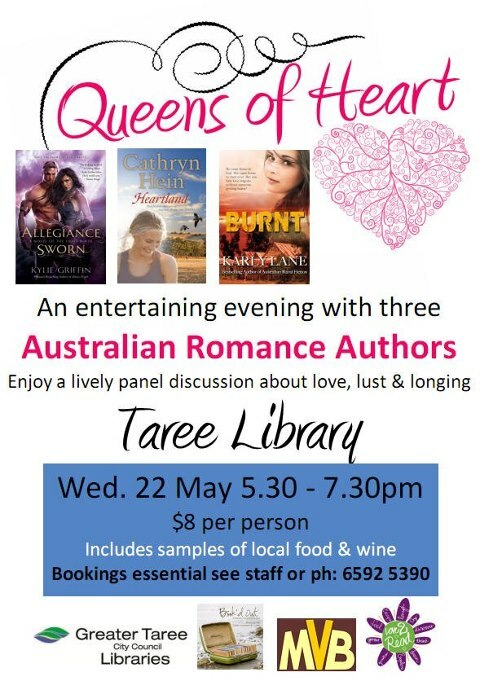 Last Wednesday, myself, paranormal and fantasy romance author Kylie Griffin, and rural romance and romantic suspense author Karly Lane met up in Taree, on the NSW mid-north coast, for our Queens of Heart panel at the town library. And what a wonderful time we had! I always knew it was going to be fun. 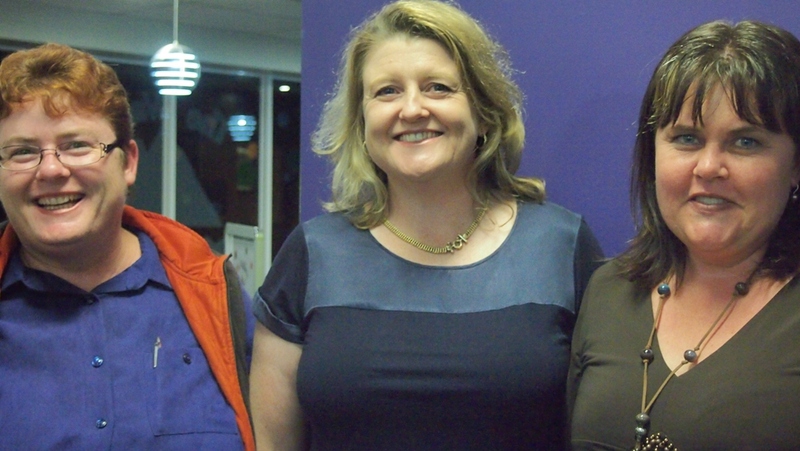 Kylie and Karly are old mates from Romance Writers of Australia conferences, hugely talented authors and lovely people. As were our hosts. Danielle and Debbie from the library put on a wonderful evening with nibbles and local wines, excellent displays and a cosy stage. Manning Valley Books were on hand to sell our books, and Shelleyrae from book review site Book’d Out helped with all the arrangements. 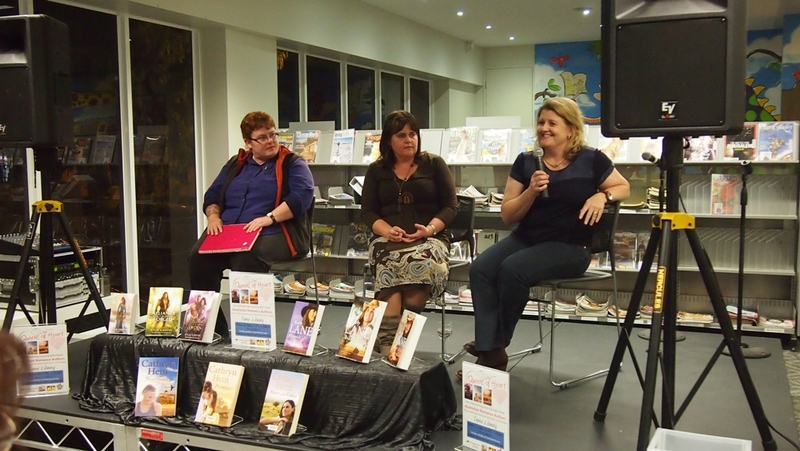 Best of all were the audience, who braved a wet and chilly night to come out and listen to Karly, Kylie and me. What an engaged and interested bunch of people. We had a great time talking about writing, how we came to be published, the industry and the influence that erotica is having on the face of romance. They threw a few curly questions at us, too. Nothing like being kept on our toes! Kylie Griffin, me and Karly Lane. On stage and having a chat. Kylie, Karly and me. Great fan Brenda and myself with my new release Heartland. I just love meeting readers! Afterward, we were treated to a very enjoyable meal at local restaurant The Sicilian (where I spent an impolite amount of time admiring the restaurant’s beautiful pepper grinders), passing by Manning Valley Books as we walked. Naturally we all had to stop and take a photo of the display. 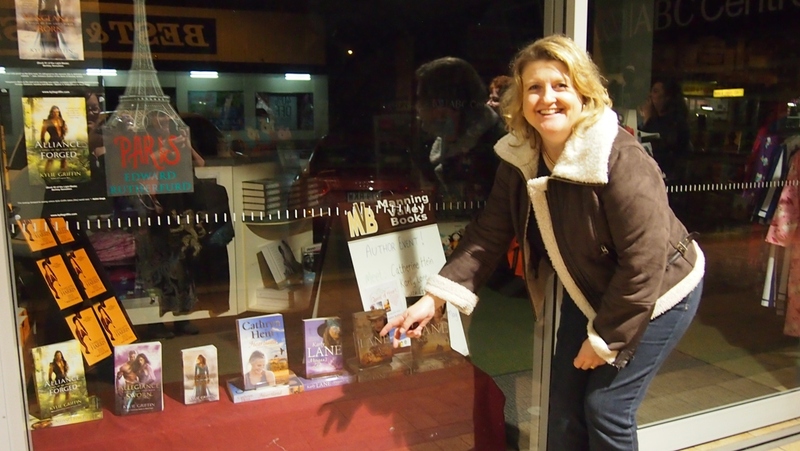 Queens of Heart window display at Manning Valley Books. It looks like we were harbingers of rain because it bucketed down overnight and on Thursday, which made for a slow drive home. But that’s okay. It was worth it. I love connecting with readers and thank everyone involved for another fabulous library talk. Can’t wait to do it again! 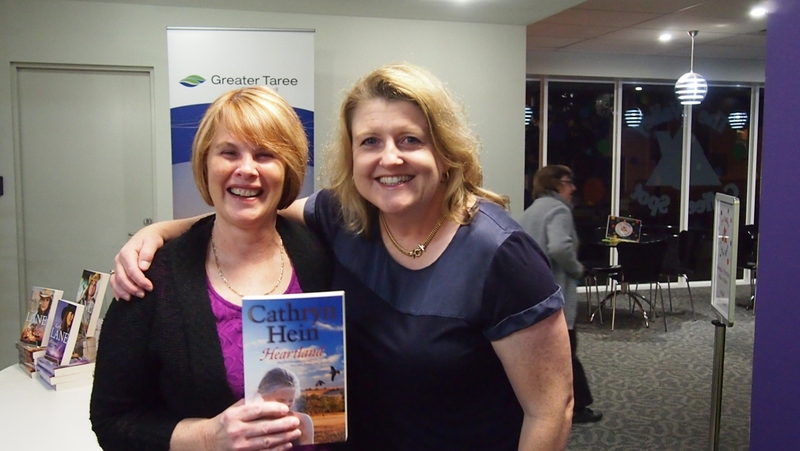 This entry was posted in This Writing Life and tagged Australian romance authors, Australian Writers, Book'd Out, Cathryn Hein, Heartland, Karly Lane, Kylie Griffin, Manning Valley Books, promo, Queens of Heart, Romance Writers of Australia, rural romance, Taree Library, This writing life on May 28, 2013 by cathrynhein.